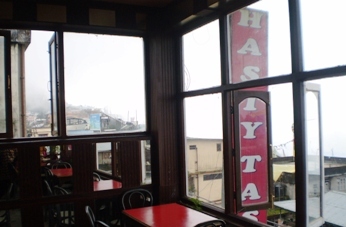 Hasty Tasty is a popular vegetarian restaurant located on Nehru Road and on the way to the Mall. This budget eatery has been running for over 18 years serving different varieties of meals and snack items. The restaurant offers dishes and cuisine including South Indian, North Indian, Punjabi, Gujrati and even Jain food. They also offer vegetarian Chinese items and Italian snacks like pizzas. The restaurant is popular with locals and tourists because the service is fast, quality decent and rates are reasonably cheap. As you walk into the restaurant from Nehru Road, you will enter a fairly large dining space with many tables arranged in rows. On the left side is a long counter where take away orders are received. Here you will see stacks of white empty boxes that are used for packing food and also mineral water bottles. Behind the counter there is a large red colored board on the wall listing all the items they serve in the restaurant by type of cuisine and meal. This is essentially a self service restaurant. So once you order at the counter, you will need to await your turn until your number is called. You will then need to go and pick up your food from the counter. 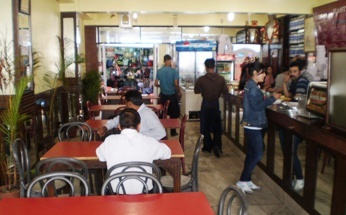 There are number of tables arranged in rows on the right side and opposite to the counter. The tables have bright red tops and black fiber chairs. The overall ambience is casual and relaxed. The restaurant is usually very busy but quite clean. There is a guy who is continuously cleaning up the tables. At the end of the dining space, there is a small section with couple of tables that have wonderful views of the mountains and the valley. Actually the dining space is 'L' shaped and this cozy view section is at the end and on the left. There is an open kitchen at the end of the counter. You can see some local ladies making the dishes. Earlier they used to display sample dishes in the glass case at the counter. However they no longer do it these days. In North Indian preparations the main dishes include razma, mixed vegetables, North Indian Thali, alu matar, alu dum, chana masala and paneer (cottage cheese) items like matar & sahi paneer etc. You also get rice, biryanis, pulao, chapatis, parathas, dal etc. There is a north Indian thali that offers a platter of various types of preparations along with rice & chapatis. In Chinese you get soups and several items including chili paneer, chili potato, momos (fried & steamed), baby corn in garlic sauce, chili mushroom etc. You get a whole range of South Indian dishes including various types of dosas, idly, uttapam etc. that are served with sambar and chutney. There is a South Indian thali as well. In continental preparations the restaurant offers various types of veg pizzas including cheese, mushroom and baby corn pizzas. There are sandwiches of different types as well. In snacks there are choices of chats like papri, chola tikka etc. Or you can go for pakodas. For beverages you will get tea (including Darjeeling tea) and coffee (hot & cold), Hot kesar milk, hot chocolate, milk shakes, lassi (cold drink made of curd) and sodas. So what are the special dishes here? Every time I came here, I ended up eating dosa or one of the north Indian snack items like Channa Batura. I asked the owner once, what are the special dishes they offer. He pondered for a while and replied "Sabh barabar chalta" meaning all items sell equally well. Opens at 9:30am and takes last order at 8:30pm. 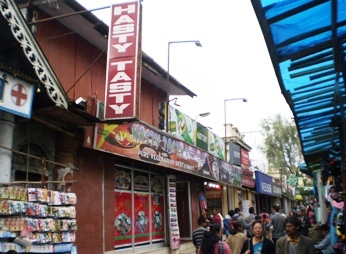 Hasty Tasty is located on Nehru Road on the left and right after the Darjeeling Pharmacy. The Chowrasta Mall is only 2-3 minutes of walk from here. You won't miss this popular eatery with large boards in front. Address: 13, Nehru Road, Darjeeling, India.